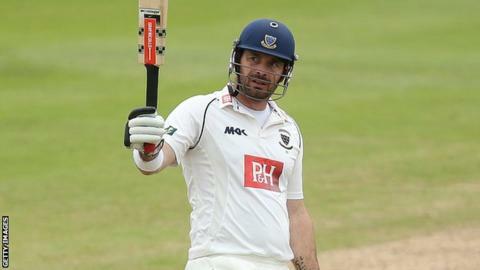 Michael Yardy scored a unbeaten century as Division One leaders Sussex recovered to reach 276-8 on day one against Lancashire. The visitors lost wickets at regular intervals after choosing to bat first, only two of their top seven batsman making it into double figures. Tom Smith took three wickets for the hosts and Kyle Jarvis two. But Yardy (132no) stood firm, his 21st first-class century, while tail-ender James Anyon made a valuable 35. The pair rescued Sussex with a determined eighth-wicket stand of 74 in 31 overs, after the Lancashire bowling attack - without England pace bowler James Anderson for the first time in this season - had reduced the visitors to 176-7. Michael Yardy's century against Lancashire ended a run of low scores for the 33-year-old. Prior to Sunday, he had made just 75 runs in five Championship innings in 2014, at an average of 15 and with a highest score of just 28. Captain Glen Chapple removed opener Luke Wells lbw before Smith (3-69) broke a second-wicket partnership of 80 between Yardy and Sussex skipper Chris Nash by having the latter caught behind by teenager Alex Davies. Zimbabwe international Jarvis (2-84), left-arm spinner Simon Kerrigan and all-rounder Luke Procter ripped through the middle order to leave Sussex in danger of not collecting a batting bonus point. But Anyon and left-hander Yardy, who hit 10 boundaries in an innings lasting nearly six hours, frustrated the hosts in the final session. And when Lancaster-born Anyon was bowled by Smith, Steve Magoffin safely accompanied Yardy through to the close, which came 4.3 overs early as the players left the field for bad light shortly after 18:00 BST and did not return. "The auditions for the next series of 'The X Factor' were being held at Old Trafford during play and the occasional burst of music provided the backdrop to a day in which Michael Yardy was the star performer. "His stand out innings was the highlight of a day where Lancashire fought hard with the ball to wrestle back control of the match after Sussex raced to 97-1 during the morning session. "An excellent spell by Tom Smith and Simon Kerrigan before lunch, and then Kyle Jarvis and Glen Chapple shortly after, had Lancashire ahead in the match before Yardy and James Anyon added 74 runs for the eighth wicket. "Jarvis, playing in his first game at Old Trafford, came back well in the afternoon session after his first four overs went for 33 runs in the morning." "A day of fluctuating fortunes at Old Trafford, with honours about even at the end of day one. "On a good pitch, Sussex will be disappointed not to have fully capitalised on the excellent start from Chris Nash and Michael Yardy. From 97-1, the next six wickets fell for just 79. "A day before his 31st birthday, James Anyon showed the benefit of playing straight with patience and determination, and the partnership of 74 with Yardy steered Sussex towards a respectable first-innings total. "But Yardy took the honours. His chanceless 132 not out was the 21st first-class century of his career, and ensured Sussex did not surrender the advantage of having won the toss."